Lupe Valdez was the county sheriff for Dallas County in Texas. First elected in 2004, she resigned in December 2017 in order to run for governor. Born to Mexican-American migrant farm worker parents, Valdez was raised in San Antonio as the youngest of eight children. She started life working in the fields but paid her way through college, earning a Bachelor's degree in Business Administration from Southern Nazarene University in Bethany, Oklahoma. She then earned a Master's degree in Criminology and Criminal Justice from the University of Texas at Arlington. Lupe Valdez served in the U.S. Army and reached the rank of captain. Valdez's career experience includes working as a federal agent. Her law enforcement career began as a jailer, first in a county jail and then in a federal prison. She then moved on to investigative roles as an agent of the General Services Administration, the U.S. Department of Agriculture and, finally, the U.S. Customs Service. With the creation of the Department of Homeland Security in 2002, she was made a Senior Agent, serving in that role until she retired to run for the office of Dallas County Sheriff. As she entered the general campaign, Valdez was widely considered the underdog in her general election race against Republican Danny Chandler. Chandler, a 30-year veteran of the Sheriff's Department, had defeated incumbent Sheriff Jim Bowles in the Republican primary. Bowles, who was tainted by corruption allegations, had held the office for 20 years. She won in the general election which made international headlines, serving four terms. In 2010, Sheriff Valdez was elected to the Democratic National Committee and was appointed by President Barack Obama to a committee regarding immigration reform. She was instrumental in changing policies on holding immigrants in the Dallas County jail for federal officials once the person is past his or her release date, which earned a quick rebuke from Governor Abbott. In December 2017, Valdez announced her candidacy for Governor of Texas in the 2018 gubernatorial election against incumbent Republican Governor Greg Abbott. She earned the Democratic nomination to become the first Latina and first openly gay person nominated for governor by a major party in the state. 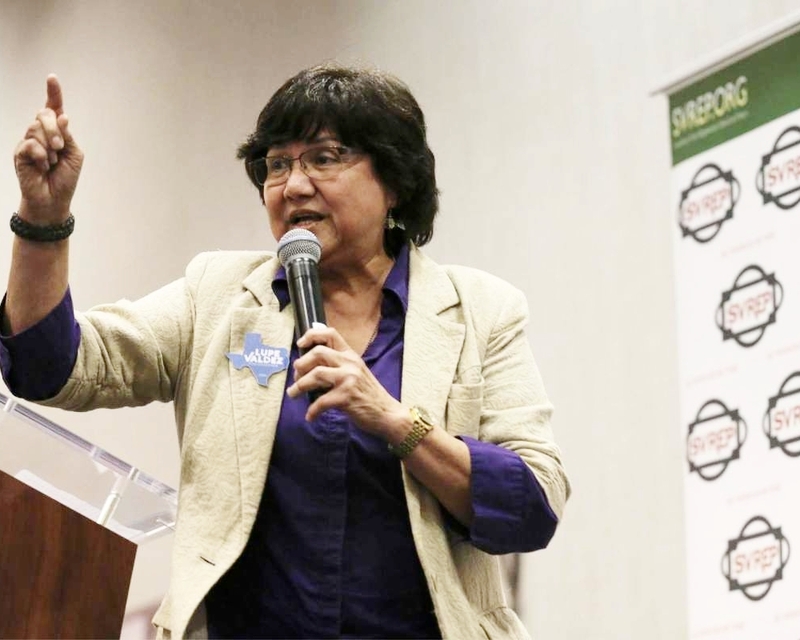 Lupe Valdez has been endorsed by U.S. Rep. Joaquin Castro, the Texas AFL-CIO and Planned Parenthood Texas Votes, among other individuals and organizations. We have made much progress, but the fight for civil rights in the modern era is far from over. For many across our state, the rights to social equality and freedom are still obstructed. Texans deserve a Governor who will be a champion for expanding civil rights, not block progress at every turn. With an alarming rise in hate crimes, we need an administration that stands up to bigotry and violence in a real way. As your governor, I will fight to expand civil rights protections and fight discrimination based on race, ethnicity, religion, sexual orientation, gender identity, or any other piece of what makes up the diverse population of Texas. For Texas to truly thrive, we need to put in the hard work to ensure that all Texans are treated fairly and equally under the law and in our society as a whole. Voting is a right that Americans have fought and died for, and it is the most fundamental way to participate in our democracy. The never-ending assault on voting rights through discriminatory Voter ID laws, unnecessarily burdensome registration processes, and tireless efforts to make it harder to vote are undemocratic and go against our values. I would fight to undo these harmful policies. In addition to fighting against mindless efforts to curtail voting rights, I will proactively advocate for legislation and policies to expand voting rights. As governor, I would push for policies like automatic voter registration and would use the bully pulpit to encourage the federal government to modernize and pass an updated Voting Rights Act. The goal should be to make it easier for more Texas citizens to get to the polls - not harder. Standing up for immigrant communities has been a staple of my life. It is my goal to make sure that young Texans don't face the same inhumane treatment I witnessed firsthand growing up. Greg Abbott and Donald Trump’s fear-based approach to immigration is inhumane, bad for our communities, bad for our economy, and wrong for Texas. To solve our immigration challenges, we need to protect DREAMers and we need to enact comprehensive immigration reform with a pathway to citizenship for those caught up in our broken immigration system so that families stop being torn apart. Too often, our broken immigration systems treats immigrant communities as bargaining chips. State and Federal officials are pushing policies on local law enforcement that cruelly rip families apart, destroy trust in communities, harm public safety, and hurt local economies by holding funds hostage to get their way. Our government shouldn’t function like that. I have carried a gun for most of my life - first in the military and then in law enforcement - and I strongly believe in the Second Amendment. But if someone cannot handle their disagreements with means other than violence, they should not be allowed to have a weapon. It’s just common sense - so why not put some common sense measures in place in our state? There are many things we can do right now to try to keep our kids and community safer. We need to push for universal background checks, and we must also close loopholes, like the boyfriend loophole, to make sure domestic abusers and others who should not have a weapon don’t gain access. Also at the state level, I would push to make it a state offense to lie on a background check and ensure our law enforcement have case tracking databases.